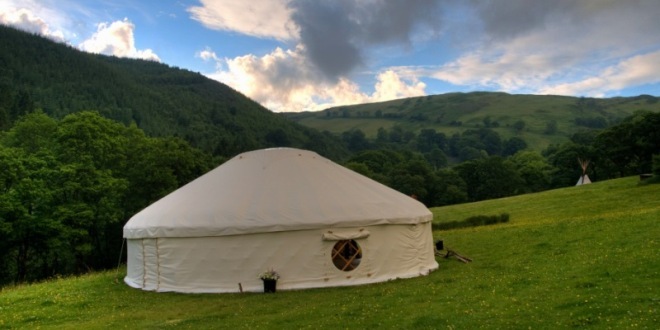 For my birthday surprise I was whisked away to….a yurt. In a field. In the middle of nowhere. With no hot water or electricity. What Made the Yurt so Special? For starters, I’d never stayed in anything like a yurt before. I’d done traditional camping before – a tiny tent, a dodgy air bed and everything ending up damp and soggy in the morning – but “glamping” in a yurt proved to be a totally unique experience; we were back to basics, but experiencing quaint luxury at the same time. 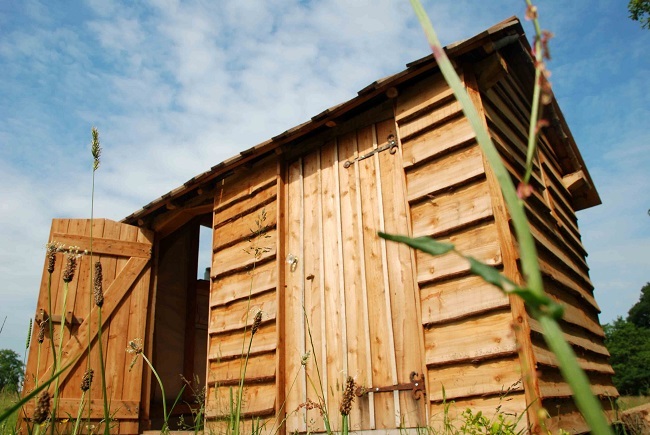 My boyfriend had chosen an Eco Reteat in south Snowdonia, near Machynlleth and the coastal village of Aberdovey. It turned out he couldn’t have chosen a better place. We arrived late on a Friday evening in the summer, and the first view of our yurt and its location was simply magnificent. He’d chosen the meadow yurt, and so it sat in the middle of a lovely open space surrounded by nothing but sheep, fields and mountains. I don’t think I’d ever seen so much green in my life, and certainly never so many shades of it. The Eco Retreat hosts two yurts and several tipis, but they are all spaced far away from each other, so your sense of peace and isolation is never infringed upon. Except for passing the owner of the Eco Retreat on the drive up the dirt road, we never saw another soul the whole time we were there. And that’s not a complaint, it’s a testimony to the utter tranquillity of the place! The yurt was unbelievable, like nothing I’d ever stayed in before, and this unique type of accommodation in its stunning location is exactly what made the weekend break so magical. 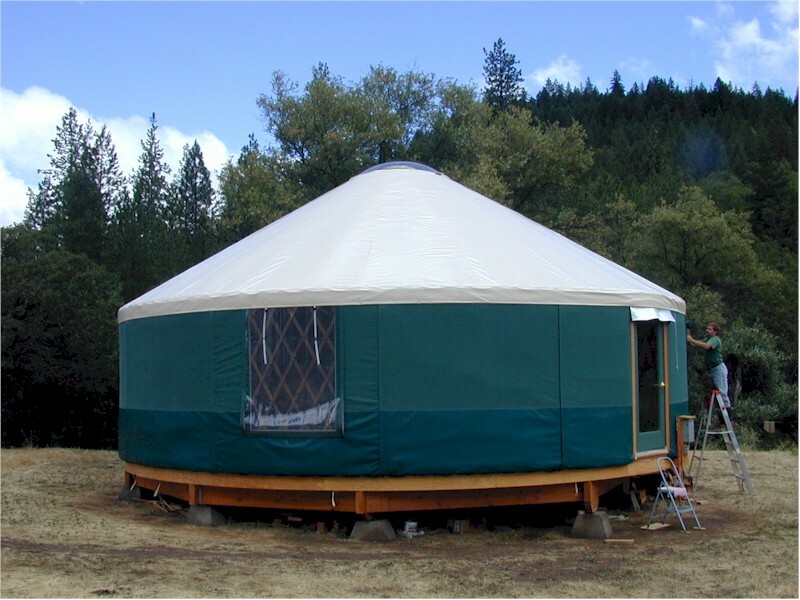 Basically, a yurt just looks like a spacious tent from the outside, which doesn’t sound like anything special, but when you first step into it, it’s breath-taking – and I never use that term lightly. I believe a lot of what makes something special lies in the details, and they’d certainly been considered in the case of this retreat. The double bed was a low to the ground on a futon-style base, and was littered with gorgeous, cosy blankets and pillows. I know it’s only a tiny detail, but sleeping so close to the ground gave the semblance of traditional camping but with added comfort, and it did make me feel like we were doing something different – as if waking up to the baaing of sheep and a dash to the outdoor loo weren’t evidence enough! I loved the skylight as well. Although we didn’t catch the stars through it, we did wake up to happy, sunny blue skies both mornings (we were so lucky to get perfect weather for our stay, which is always hit-or-miss in the UK! ), which is a really lovely way to start a day. 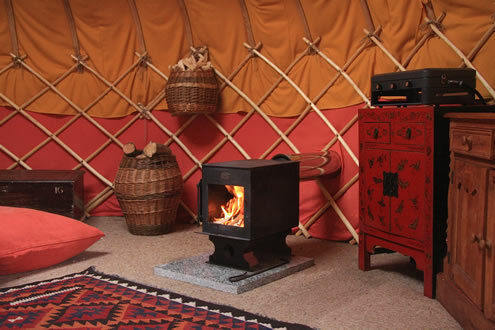 My next favourite thing about the yurt itself was the old-fashioned wood burning stove. My boyfriend labelled me the “Twisted Fire-Starter” for the duration of our stay, making it my responsibility to light and tend to the fire. Normally, I don’t take kindly to being told what to do, least of all my boyfriend, but I was intrigued by the stove, and I think the pyromaniac inside me was a little bit excited at the prospect of having Sole Responsibility for the fire. The stove really added to the character of the yurt and its old-fashioned charm, and – with the help of the abundant supply of candles and beautiful candle holders generously littered around the yurt – created an incredibly romantic, relaxing atmosphere. I was totally taken with the back-to-basic lifestyle of the yurt – it was all very Little House on the Prairie! Because of the absolute isolation of the yurt and its accompanying private outdoor toilet and shower, and because it was summer and we had gorgeous warm weather for the duration of our stay, I wasn’t phased at all by having to do a dash up the dirt path to use the facilities, and, despite it being an outdoor toilet, I have absolutely no complaints about it at all! What did freak me out at first was the lack of provision for my hair straighteners. I’m anything but a girly-girl, but I do like ensuring my hair is looking its best at all times. 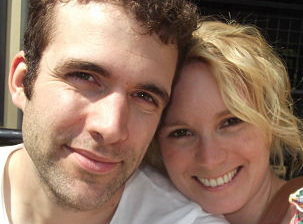 Plus, it was only 18 months into our relationship – way too soon to be letting the beauty standards slip! However, I was forced to resort to the “natural” look and, six months later, we’re still together, so coping without my straighteners for a weekend wasn’t the worse thing in the world! 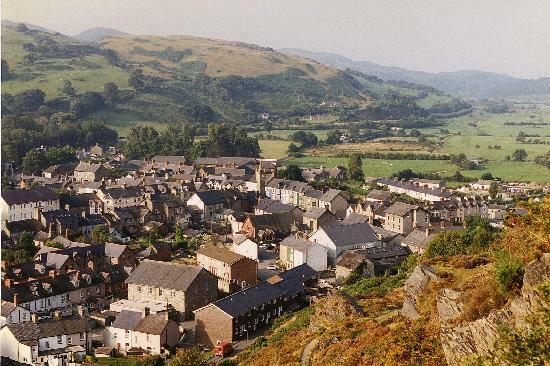 The great thing about staying at the Eco Retreat in Machynlleth is the wondrous variety of the area. 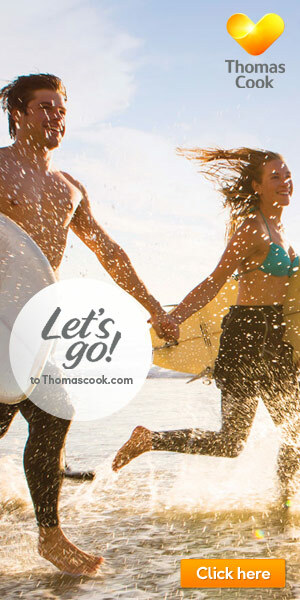 It’s got villages, mountains, forest, beaches – all within a short drive from each other! At the risk of stating the obvious, the place is a mecca for anyone who enjoys hiking. 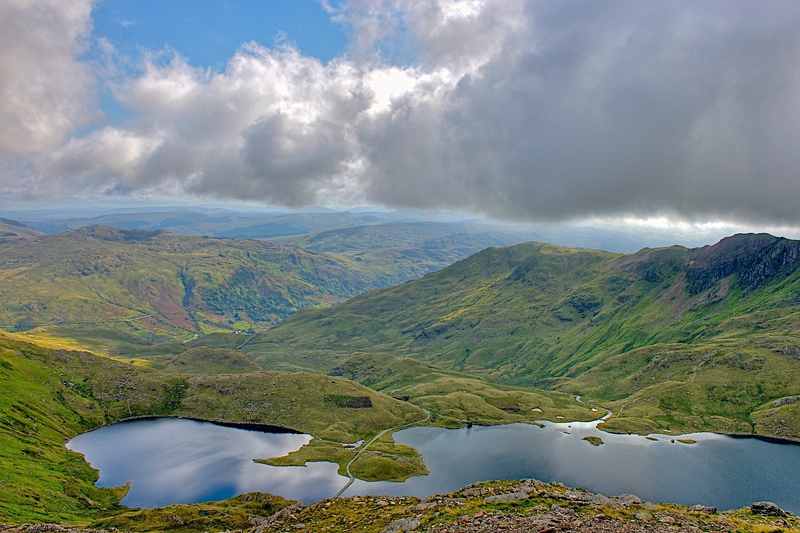 There are hills and mountains aplenty, and the views are simply gorgeous. If you’re looking to up the pace a bit there is a good choice of mountain biking routes in the area, including the hard-core CliMachX trail through the Dyfi forest, so don’t forget to bring your bikes and really make the most of what the area has to offer. If myths and legends are your thing, you can’t miss out on the totally unique experience of exploring King Arthur’s Labyrinth – an intriguing network of caves and caverns – by boat, which makes it extra-special! We spent one really chilled out day on the beach at Aberdovey (Aberdyfi to the locals! ), a mere 20 minute drive from the retreat. Aberdovey is a laid back, picturesque little village that boasts a beautiful sandy beach that’s perfect for sunbathing (which is exactly what I did, with a book, for hours – heaven), a plethora of water sports and a variety of quaint little gift shops – everything you could ask of a friendly seaside village. We only stayed at the yurt for a weekend break, but I could have quite happily have stayed for at least a week. The thing I regret the most is not taking advantage of the meditation sessions offered at the retreat. The Eco Retreat prides itself on being the perfect place to relax, de-stress and find inner peace, and, although I felt all these things purely from being in such a stunningly beautiful, tranquil place, I would have liked to try these sessions to have a more heightened experience. I blame my boyfriend, of course; because it had been a surprise break, I hadn’t had any input into planning our itinerary, and he was all planned-out with arranging the break in the first place so hadn’t looked into it properly. It’s DEFINITELY on the list for our return trip though! A weekend break at the Eco Retreat in Machynlleth was the perfect break for us. Given its stunning location, nestled in southern Snowdonia amidst forests, fields and mountains, the retreat is ideal for a relaxing escape from the stresses and chaos of everyday life. 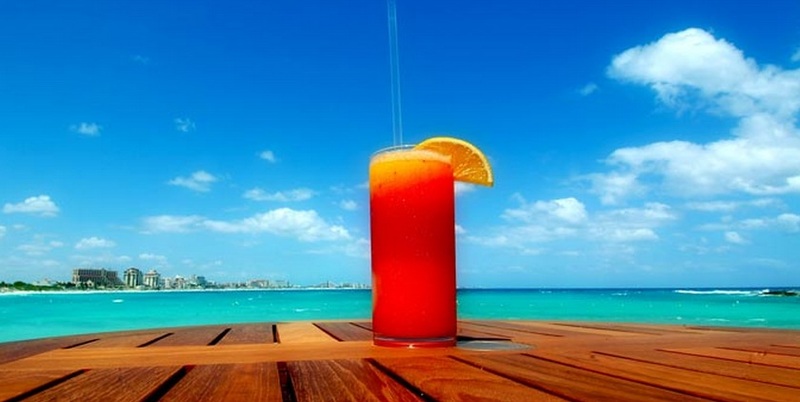 However, it’s also great if you want an action-packed holiday as well, so it seems to offer something for everyone. I wouldn’t consider “glamping” in a yurt a “posh” version of camping, designed for those who want to avoid soggy, cramped tents and mud, and I wouldn’t consider it a downgrade from a luxury hotel. I would consider it an entirely unique experience in its own right, and one I would desperately love to experience again. This article is provided by Kate.